''Though free to think and act, we are held together, like the stars in the firmament, with ties inseparable. These ties cannot be seen, but we can feel them"
A profound saying by Nikola Tesla (1856-1943) was a Serbian-American inventor and physicist. We all owe him for his contributions to the establishment of Alternating current. If we read the autobiography of Nikola Tesla, We'll Understand he lived a happy life with the real positive approach towards life. What we got here is nice saying. He said two facts here. 1: We are free to think and act. 2: We are held together, with inseparable ties. Even if both the statements contradict each other, both are true in fact. So how come both the statements are true when they appear contradicts each other. The answer is so simple. First one is lower truth and the second one is the higher truth. Here let's think about our thoughts and actions. You are reading this article just because you chose to read it. It is your decision to read it. Our decisions and actions are what we chose. There is playing a good movie in the I-Max nearby. It's our decisions to watch. What about a job, one selects a job according to his character. Though we are free to think and act. Fine, but the real question is about invisible ties. Where is it ? 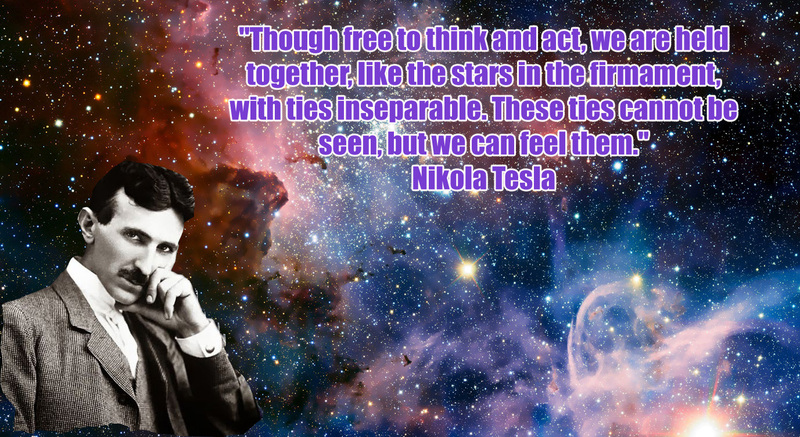 Why a man like Nikola Tesla telling us about Ties, which is not even visible.The shallow thinking here won't let you understand what he said. What is a Tie ? A bind, bond, cord, connection. A connection can be two types. We could say that Our Mobile phone is connected to charging. We connect our charger here, It is a visible connection. What about if two mobile phones are connected via blue tooth. We can't see a visible network. Still it is connected, information's are shared invisibly. When two people talk to each other, what is happening is a kind of information sharing. This is same if we just see something with our eyes. We perceive something, we understand something. Though it is not a physical connection, but is an invisible mental connection. Whatever we see, whatever we hear, and whatever we understand, we perceive something. Have you ever realized this before? Read the quote again there is something he said we are held together. As a social being, we are emotionally attached to so many things. We cannot think independently. What is really happening is we all chose something from a well defined set of choices. Everybody have their own character limitation . Hence, one can only chose things according to his character and personal limits. Everything is limited, Choices are limited. We merely select something from a limited number of choices. We held together to family, society, nature and everything.